A wellspring of information on how to live the healthiest life possible. When we say the healthiest life possible we don`t mean just the physical health of your body but the the greater you, you and your ecosystem. the healthiest life possible for you and your planet. Treating dog bites with lavender oil. This is not about treating people who were bit by dogs, but treating dogs who were bit by other dogs. So this may be a really good bit of information for all of you dog owners. Last week I got back to Israel from a short visit to States(it was an amazing trip, thinks for asking). Anyway I had bought a small bottle of lavender oil when I was there to treat some bat cracks on the bottom of my feet. For those of you who don’t know lavender oil is great for all sorts of skin problems, its just super healing and soothing. This past weekend my sister in law was by us with her dog. She took her dog out for a walk on Friday night, and he was attacked by two of our neighbors dogs. Now this is never fun when your dog gets but by other dogs, but at least she was able to verify that the other dogs had all of their shots. So she runs into our house all upset that her dog got bit on the leg and is bleeding, she wants to know if there is an emergency vet in town, which there is not. At first all we see is a small puncture wound on the outside of one of his hind legs. So I say “hey no big deal, I will just put some hydrogen peroxide on it”. So that’s what we do, and we all go to sleep. In the morning she tells me we didn’t see but he has a deeper bite on the inside of his leg. Now the poor dog is really in pain and limping. So I figure hey lets try some lavender oil, it works great on people, why not on dogs. So she puts on his muzzle so he wont take a bite at my leg, and I dump a bunch of lavender oil on the bite. No joke, the stuff seemed to work magic. First of all its great, because the dog wont lick it off, and second it really just stopped the pain. He couldn’t tell us this but he started walking with out a limp and everything. So hey you should always have lavender oil around, and now you know it is great for your dog also. Gotu kola is one of the first herbs that I ever tried even before I started to study natural medicine. I even remember buying a tincture of it when I went to visit my in-laws for the first time after me and my wife got engaged. It felt like it had an immediate effect on my mind and helped me to think clearer. This may have very well been a placebo effect but maybe not. Anyway I have gone through the two articles that I have linked to at the bottom of this post and it seems to me that the clinical research on Gotu kola is very supportive of its traditional uses. Even though one of the articles concludes by saying that more research is needed, almost all of the clinical trials that are mentioned prove the herb to be effective for treating what it is traditionally used for. What is very interesting that I learnt from these research papers is the possible unwanted side effects that can result from excessive use of the herb over an extended period of time. Even the use of the herb to protect against radiation is shown to be valid. Here are the uses that were tested in the second of these two studies. Medical description: An inflammatory brake in the outer layer of the gastrointestinal tract. The symptoms of an ulcer usually include burning and pain; also you could have blood in the stool. Holistic understanding: Ulcers are for the most part connected to stress and/or the use of alcohol. Also the bacteria known as heliocbacter pylori are known to be connected to the formation of ulcers and higher levels of acidity. Herbal remedies: There are a lot of herbs that are soothing to the digestive tract such as chamomile, slippery elm, marshmallow, and licorice root. Also herbs that help to heal the open ulcer such as yarrow and lavender can be used. Use calming herbs also like passion flower and hops. When the test results for helicobacter are positive papaya enzymes that can be bought it tablet form are very useful. Herbal formula: Boil one table spoon of each marshmallow root and licorice root I four cups of water for twenty minutes. Then add a table spoon of chamomile flowers and let steep for another fifteen minutes. Drink one cup three times a day. There is also a classic treatment with just chamomile that goes as follows. In the morning on an empty stomach drink a cup of chamomile tea and then spend five minutes lying on your back stomach and either side. I am pretty sure that I have written about this killer herbal formula before, but because I just But together a batch I decided to write up another one. When I say killer herbal formula, I mean it with full pun intended. Not only because of its powerful anti-bacterial activities, but also because of the story about how it was discovered. As the story goes, these four guys were busted luting houses of the dead during the black plague. Now what surprised every one was that these thieves were not sick with the plague them selves, even though they were working in very contaminated conditions. It turned out that they were the sons of an herbalist who had taught them how to make a super anti-bacterial herbal vinegar, which had prevented them from getting sick. There are different variations to what was the exact formula, but what I was taught is that it contained four herbs. Some of the variations also call for garlic. As I have all ready mentioned I just put together a batch of this super anti microbial vinegar, and I did a bit on the fly because some one needed it to help treat a possible case of strep throat. It is best to make the vinegar using dry herbs and apple cider vinegar, but I didn’t have those. So I used regular natural vinegar and mostly fresh herbs. Fresh picked rosemary and sage from my garden, fresh oregano and garlic from the supermarket, and some dry lavender that I had in the house. Also its best to let the herbs soak in the vinegar for a week or two before straining them out and using. But because I needed the remedy I put it all together and double boiled it for about a half an hour. In the end it came out dark and potent smelling, and I am sure that it will do the trick. Some times you just need to be resourceful. 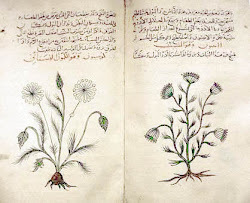 Free E-book & Audio on "How To Treat Coughs"
Materia Medica, c. 1334 copy in Arabic, describes medicinal features of cumin and dill. I am a licensed practitioner of western herbology, nutrition, aromatherapy and reflexology. I am also the father of three beautiful boys and the proud husband of the best woman ever.